For as long as I can remember, I have lived in two worlds. One is the environment that I physically occupy. In that reality, I am a wife and mom who lives in the suburbs and has a really interesting editorial job. But in my inner world, things change fluidly. When I was a shy little girl, for instance, I imagined I was bold and outgoing; I could tell great jokes, and everybody would laugh. Sometimes I would conjure a new place—even outer space. Why not? In my secret world, I could go anywhere I pleased and be anything I wanted to be. I had no idea, until much later, that not everybody has such elaborate fantasies—or that they could be problematic for some people who get too engrossed. Still, as Josie Glausiusz writes in this issue’s cover story, “Living in a Dream World,” people generally spend about 30 percent of their days with their minds elsewhere. 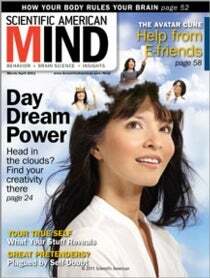 Daydreaming can inspire us and help us be more creative. But like an overdose of honey, it can also be cloying or smother us if we overindulge. Apart from our waking visions, our internal perceptions can trap us into not accepting reality. One such case is people who experience the “imposter phenomenon.” As Birgit Spinath writes in “Great Pretenders,” such individuals believe their achievements are actually undeserved. Although all of us tend to grant a measure of power to external factors over our successes and failures, victims of imposter thinking go much further. They are in constant fear of being found out as swindlers. Daydreaming and imposter thinking are hidden shades of our personalities. But what about how we look to the world? “You Are What You Like,” proclaims Christiane Gelitz. We reveal a lot about ourselves by our cultural preferences: by our music choices, our art tastes and even how we decorate our surroundings. As opaque as we sometimes perceive ourselves to be to others, we are often endearingly transparent as a species.